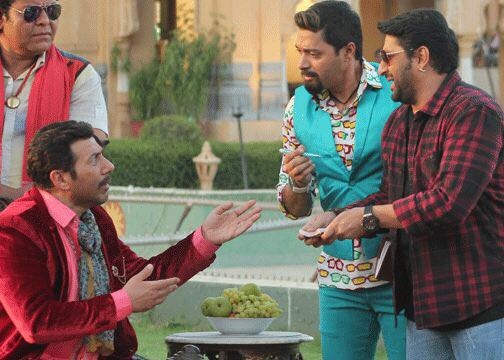 Known for his versatility and on-screen charm, Sunny Deol is ready to make the audience roar in laughter with his upcoming film Bhayyaji Superhitt. Directed by Neerraj Pathak, the film also stars Preity Zinta, Arshad Warsi, Shreyas Talpade, Ameesha Patel, Sanjay Mishra, Brijendra Kala, Jaydeep Alahwat, Pankaj Tripathi and Mukul Dev in pivotal roles and is slated to release on 14th September 2018. To our surprise, Sunny Deol for the first time ever will be seen playing a double role performing two opposite characters at the same time. Bhaiaji Superhit brings to you the story of two different worlds in a single frame, convincingly justifying to what happens when Bollywood rub shoulders with UP underworld. Talking about his character in the film, Sunny says, “I am looking forward to this film as this is the first time that I am playing a double role. The subject of the film is also quite novel and something that I have never attempted earlier”. The story is said to be funny and light-hearted with a hint of intense emotional drama. It also promises some high octane action stunts. The film has the gorgeous Preity Zinta portraying a dear wife and will be seen in unusual avatar. Not to forget, the crackling chemistry between Sunny, Arshad and Shreyas with that extra dose of comedy would be hysterical to watch. We can’t wait! Presented by Hanwant Khatri and Lalit Kiri, produced by Chirag Mahendra Dhariwaland directed by Neerraj Pathak, Bhayyaji Superhitt will hit the theatres on 14th September, 2018.